The Amazon Fire TV and Fire TV Stick have taken the world by storm. However, it’s only officially available in a limited number of countries. If you’re one of the 45,000+ British expats living in Singapore or an expat from another country and you’ve taken a Fire TV or Fire TV Stick with you then you’ll know the majority of apps don’t work. In this guide I’ll be showing you the incredibly simple steps you can take to make your Amazon Fire TV or Fire TV Stick work in Singapore. This guide is mostly aimed at those who’ve got a British device but it will also work if you’ve got an American, Indian or Amazon Fire TV or Fire TV Stick from any other country. To use your Amazon Fire TV or Fire TV Stick in Singapore you’ll need to get a VPN app for your device. This will allow you to unblock and watch your favourite apps. These are sold by hundreds of different companies but most don’t support the Amazon devices. My recommended service is ExpressVPN. They work well and they have a dedicated app for the Amazon Fire TV and Fire TV Stick. Follow the steps below to get ExpressVPN and use it to make your Amazon device work in Singapore. On your Amazon device search for ‘ExpressVPN’. Download and Install the app. Once installed open the app. Login with the account details you created at sign up. Press the ‘Connect‘ button if it doesn’t automatically connect for you. It will take around 15 – 30 seconds for the ExpressVPN app to connect. Once it’s connected any apps you use or websites you visit will think you’re in the UK rather than in Singapore. If you’re from another country such as the United States or elsewhere you can of course connect to that country and then you’ll be able to access the apps from your particular country. There are absolutely masses of companies that offer VPN services these days. Simply typing the term ‘VPN’ into Google will leave you with a headache-inducing amount of choice. It’s important to remember that most providers aren’t suitable for the Fire TV or Fire TV Stick because they don’t have dedicated apps for the devices. My recommendation is ExpressVPN as detailed above because they’re really easy to use. They all work much the same as ExpressVPN detailed above. Simply pick one and sign up. Then follow the steps from above to use the VPN on your Fire TV or Fire TV Stick. Now that you’ve got a VPN and have connected to the UK (or your home country) you’ll be able to use your regular apps just as if you were at home. For example with the British Fire TV or Fire TV Stick you can use apps like ITV Hub, TV Player, Channel 4 and more all in Singapore. If you want to use BBC iPlayer then you’ll need to do so via the website rather than their app. For this download either FireFox or Silk Browser and then navigate to the BBC iPlayer website as normal. 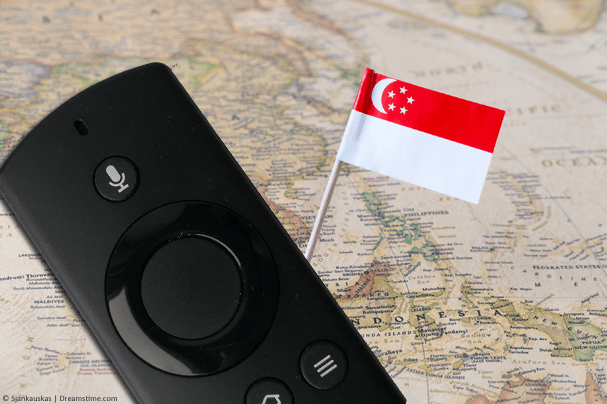 As long as you’re connected to ExpressVPN you’ll be able to watch BBC iPlayer on your Fire TV or Fire TV Stick in Singapore. If you’ve got Netflix then you’ll be able to access your home and other regions of Netflix too. Unfortunately, it’s impossible to unblock other regions of Amazon Prime. How does the VPN work and is it legal? If you’re wondering if a VPN app is legal, then yes, they’re 100% legal in almost all countries across the world including Singapore and the UK. It works by sending your internet data via another location first before being sent to your requested site or service. For example, when you’re in Singapore and you try and access the BBC iPlayer website on your Fire TV or Fire TV Stick your request goes directly from you to the BBC iPlayer service. BBC iPlayer can see you’re in Singapore and not the UK so it’s easy for them to block you. When you use ExpressVPN your request is first sent to the UK and then onto the BBC iPlayer service. BBC iPlayer only sees a request from the UK and so plays the videos you want to watch. This is then sent back to you in Singapore by the VPN service. Using the Amazon Fire TV or Fire TV Stick in Singapore is easy no matter which country you bought your device in. For this you’ll need to get a VPN service. I recommend using ExpressVPN. You can get their service by clicking the button below. Once you’ve signed up download their app directly onto your Fire TV or Fire TV Stick. Open the app and then connect to the United Kingdom or whatever country your Fire TV or Fire TV Stick is originally from. Now you’re connected you’ll be able to use any of the apps you usually use in Singapore as if you were at home in the UK or any other country. What apps have you been using most on your Fire TV or Fire TV Stick in Singapore? I would love to know so why not post in the comments section below?